Blog - J&J Roofing Co.
Posted on April 10, 2017 by J&J Roofing Co.
What a conundrum. Los Angeles roofers are raining business this year. Why? First of all, as of the beginning of February, downtown LA had gotten more rain in 2017 than the average norm in an entire year. This is pretty much the tale across Southern California. Since December the rain stats have been almost two times the average throughout much of the state. According to the Western Regional Climate Center, the period from October 2016 to February 2017 was wetter in California than any other years since the records began in 1895. J and J Roofing, located near Silverlake and Los Feliz, has been flooded with calls and is raining business. (Yep, play on words.) Known for their quality and customer’s trust level – it was not surprising that when roofs began to leak they got under water with all those phone calls. J and J Roofing, top Los Angeles roofers, had so many calls they had to stop accepting new clients until this month. So if you have some roof work you need done, now is the time to make an appointment. For a Free Estimate – contact us at 323 913 4190 or on our website. Is Energy Efficient Roofing in your New Year’s Resolutions? Posted on January 2, 2017 by J&J Roofing Co.
Energy efficient roofing is indicated by its Solar Reflective Index (SRI). The SRI designates a roofing material’s ability to stop the material from absorbing the sun’s heat by how it reflects the sun. You can save quite a bit of money over the years by covering your home with a high quality, energy-efficient roof. Of course, if you have a poorly insulated, low-efficiency roof your heating bills in the winter might be higher and your cooling bills quite a bit more – leading to exorbitant energy bills. A “cool roof” is an energy efficient roof that has been constructed so as to reflect more sunlight and absorb less heat than a standard roof. Cool roofs are either a sheet covering, made of a highly reflective type of paint or else highly reflective tiles or shingles. Almost any home or building will benefit from energy efficient roofing but an evaluation of the climate and other factors is smart to have done before spending the money to install one. A standard or “dark roof” often reaches temperatures of 150°F or more in the summer sun. A cool roof would be expected to stay more than 50°F cooler under the same conditions. This has been found to save a considerable amount of money over a few years’ time using less air conditioning. It works a lot like wearing light-colored clothing on a sunny day. The light-colored roof or light-colored clothing reflects the sun and does not absorb as much heat. Many more details can be found at a US Government website called energy.gov. J and J Roofing can help you with your evaluation of your new roof and help you to choose the best energy efficient roofing option for your home. Having been in business for almost three decades and trusted for the high quality service and workmanship makes them a good choice. Posted on December 24, 2016 by J&J Roofing Co. Sounds like a silly question, if there’s water dripping from your ceiling you probably know the answer but it’s not always so simple. A lot of times a roof leak doesn’t show up inside the home and you simply may not be aware of it. There can be many causes for this. A lot of homes have extensive overhangs and any roof leaks there probably will not show up inside the home. Most homes have insulation and a roof leak that drips down onto the insulation will get soaked up and may not actually show up on the ceiling. Leaks can drip down inside walls and not show up as wet spots. You get the idea: roof leaks can happen without being very visible and these often lead to mold or damage to framing that the homeowner is not aware of until it becomes extensive. That is not speculation, as a roofer for 20 years, I can tell you that on a weekly basis, I remove roofs, only to find extensive dryrot to the wood deck and even framing (structural) which occurred due to leaks which have been ongoing for many years, in some cases, decades. It’s important to have your roof checked every year, usually in the early fall, by a professional roofer. Roofing estimates should not cost you anything, and they should be free of any obligation. And if a roofer says you have roof problems – don’t take his word for it – make him prove it to you (to the best of his ability and note, that is not always possible so take that with a grain of salt). But for example, in-as-much as possible I take photographs of every problem area on a person’s roof and even if it’s not obvious I can digitally edit the photograph to show the homeowner what I’m talking about and I email those pictures along with the proposal. The best time to do this is before winter or after, but regardless, if you haven’t had your roof checked for a roof leak in a while, make an appointment with your roofer and if you don’t have one, check Yelp/Google/Angie’s List, etc, for the top-rated roofers in your area. Posted on November 6, 2016 by J&J Roofing Co.
Roofs in the Southern California area are worn out. 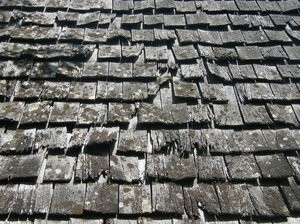 The drought affects roofing — I see it every day and some roofs are so bad, it’s unbelievable. Our sun is the great destroyer of roofing materials, leaching the petroleum oils out of the membranes causing them to dry up and crack and cause leaks. Why is this happening now? What is different? Isn’t this normal? Well it’s nothing new but the drought affects roofing is fairly epidemic now and that is because over the last 10 years we have had a far greater quantity of days filled with sunlight than we have had at any other time in decades (several of the warmest/driest summers ever recorded). One of the side effects of being in a great drought is getting so much sun (with few clouds and of course little rain). Simply put, those things which do not respond well to the sun get a lot more of it. And, outside of the 2010/2011 winter season where we experienced slightly above normal rainfall, most roofs in the LA area have not been seriously tested with rain since 2005/2006. And even in the 2010-11 winter, none of those rainfall events were very serious. They did not involve raging storms with high winds and great volumes of rain in short periods of time in most areas. I’m looking at roofs every day that are so worn out and full of holes that in any other part of the country, the home would be destroyed – these homes have been in need of a new roof for many years. I believe there are a LOT of roofs in LA that are primed for bad leaks. 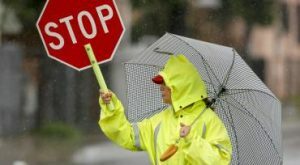 The reason drought affects roofing matters is that when we do have even a normal amount of rain (16 inches), never mind 25+ inches (which I believe, statistically, we are due for), the roofing industry in Southern California only has so many roofers and will be instantly overwhelmed. Your average roofing company can only process about 50 appointments a week for estimates and can only handle 4-5 major jobs along with maybe a dozen small repairs. In other words, all the roofers in Los Angeles can only handle a few thousand people a week. In an area of some 13 million people, it’s a recipe for disaster. If we suppose that 5% of the area had roof issues, at the rate of 3000 jobs/week, it would take 217 weeks for SoCal roofers to get it done. I recall wait times in 2005 of 6 months. We’re due. Get your roof in order now because this winter, it may be too late. For a Free Estimate – contact us at 323 913 4190 or on our website. Posted on October 6, 2016 by J&J Roofing Co.
It’s not a good idea to put your roofing interests off to the last minute. Checking for roof damage annually is so important. And when is the last minute? …as soon as it might start to rain. So summer is “officially” over – we are slipping into fall and (hopefully) that means that the rains are gonna’ come! If you put off your roofing needs, you will have to stand in line with all the other Southern California homeowners and building managers who assume that they can just phone a roofing company a few weeks before the rains begin and get immediate service. Honestly, that is NOT the case, especially in SoCal. “Everyone” waits until the weatherman forecasts rain to call the roofer. But first, how about a little self-check to see how your roof is doing? Regular inspections will allow for early detection of roofing problems. Then, if you perceive the something you can call for a professional roofer to verify what you have seen. Begin with an interior inspection of your home. You first check all ceilings and walls for signs of leaking. Look for spotting or check for mold or a musty smell. The most common problem leakage areas are important to check such as around chimneys, vents and other holes in the roof. Make sure to grab a flashlight and make a trip to the attic. Check for outside light showing through the roof and any signs of leaking. When you take a look at the exterior of the roof, pay attention to such things as torn, cracked, bald or missing shingles. Look for areas of the roof that may be curling, blistering, buckling or rotting. Algae growth may appear as green or dark stains and most often occurs in humid climates. Inspect around the chimneys, pipes, vents or other penetrated area for loose material or deterioration. Roofers use flashing material that is placed to prevent water penetration. Closely check the flashing for any signs of wear and tear. If you notice quite a bit of shingle granules in your gutters – your shingles are likely wearing thin. Checking for roof damage includes checking for weakened decking or decking that sags between the rafters. If both the rafters and the decking are damaged it is time to consider a new roof. We rarely suggest a re-roof over the existing roof in this situation as it tends to lead to major future problems. When there is extensive damage to rafters or decking you should plan to remove the old decking and put on a new roof. 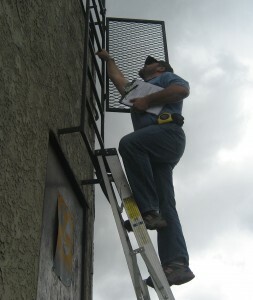 An annual roof check is not just good planning, it’s a necessity. J and J Roofing will inspect your roofing system and do any minor maintenance that we find is needed for the cost of $155. But if the inspector finds that you actually need more than a simple roof check-up then your $155 roof check becomes a free inspection and you will get an estimate for the work needed. No obligation! Posted on June 23, 2016 by J&J Roofing Co. If you have a predominantly flat roof, you need to know about TPO roofing. TPO is a chemical acronym for ThermoPlastic-Olefin. Basically, it’s a somewhat stiff, white plastic that is rubber-like. It’s been around longer than you think (roughly 20 years) and in the genre of roofing is known as “single-ply”. The first single-ply product was EPDM, and then PVC which came about several decades ago. For most applications, TPO became the go to product and most all single-ply installations are now constructed using TPO. TPO is great because it comes in many colors. Especially white which is the most ultra-reflective surface you can really put on a roof. It’s easy to clean, durable, lasts 20-plus years when done right using a good product. Most homeowners can locate and possibly repair problems themselves temporarily. Because it is such an environmentally sound product, reflects the sun, often doesn’t require removal of the existing roofing. It is ultra-lightweight and costs about the same as most conventional flat roofing material installations. I predict that by 2025, this will be the predominant flat roof product. Hot tar and torchdown are inherently messier, more dangerous (requiring special insurance, etc.) and more environmentally unfriendly. And because they are asphalt based (oil based) they are tied to the cost of oil. Asphalt is at the bottom of the chain of products that result when refining petroleum. As the process has increased in efficiency, there is less and less asphalt to be had. While no conventional flat roofing product, including TPO, is covered by warranty under ponding water, most roofers agree that TPO is the best choice where ponding water is unavoidable or is deemed to not be practical or cost-effective to correct. Most major institutions, corporations, and commercial entities, when specifying new roofs, will specify TPO. They are interested, usually, in long-term solutions so it’s notable that the pro’s consider TPO the way to go, and as a 3rd generation, Certified Master Installer, and of course licensed roofer, I tend to agree. This article is contributed by Matt Glass, Vice President of J and J Roofing, servicing homes and businesses for all roofing needs in the greater Los Angeles area including Sherman Oaks, Pasadena, Studio City, Burbank, Encino, Woodland Hills and Glendale. J and J Roofing offers commercial TPO roofing providing expert installation with a veteran crew and top-of-the-line equipment. Posted on May 22, 2016 by J&J Roofing Co. There are different scenarios that answer the question in different ways. These include a leaky, worn roof. Also, upgrading to a new roof for aesthetic purposes will have another answer. A homeowner should know the different choices in roofing materials in order to make an informed decision. Of course, if your roof is leaking and obviously worn out, you must get a new roof, because the investment in the purchase of a new roof will certainly keep your home from decreasing in value. Failure to replace a worn roof can result in interior damages to your attic or home. It can cause structural damage and other problems. Fixing a leaky roof may save you the cost of repairing any damage that may be caused by a leaky roof. I have seen walls, ceilings and floors that needed to be repaired because of water damage. If you let it go long enough you could even get mold and that is a very expensive repair. Replacing your ordinary roof with a premium roof can be a good investment prior to a sale, particularly if you are in a neighborhood surrounded by homes with higher end roofs. But if you live in a moderate neighborhood, it’s not likely that a new superior roof will get your investment back on the sale price. If you are not selling your home and you wonder if putting a beautiful new roof on the house will increase your home’s value, that is not certain. You are more likely to get on ROI on a new kitchen or updating other interior parts of the home. If you must get your roof replaced make sure that you have hired a roofer with years of experience, who has the insurance and licensing in place needed by your city and your state to legally roof your home. Cutting corners to save money on a roofing job is one of worst decisions you can make. Take a drive around your neighborhood. Look over the different types of roofs. Go to a nicer area and look them over. And then go to a lower income area and look at those roofs. That will give you a good idea of the minimum quality of roof you want to choose. Then call J and J Roofing. We will come out and give you a free estimate. You can compare the cost of roofing with different types of roofing materials. Then you will be able to make an informed decision. J and J Roofing services many areas in Los Angeles including Northridge, Pasadena, Sherman Oaks, Burbank, Studio City, Tarzana, Woodland Hills, Encino, Los Feliz and Silverlake for all roofing needs. How Can I Tell If My Flat Roof Is No Good? Posted on January 15, 2016 by J&J Roofing Co. The first step is to identify what sort of flat roof you have. The most common flat roof is smooth and white with a mineral grit surface, known as either torchdown (applied with flaming torch) or hot tar. This flat roof is also known as a gravel roof, also applied with hot tar but increasing in popularity are rubber or plastic roofs, known as single-ply, commonly called TPO (in the past, called EPDM). If you have a mineral grit roof, and the grit hasn’t come off, then it’s in reasonably good shape and probably not in dire need if replacement anytime soon. The most common sign your flat roof is wearing out is pretty simple, you will start to see the granules coming off quite a bit. You’ll see the black membrane start to show through all over. If it’s just in one spot or another, it could be because of foot traffic or maybe in front of drain where the roof wears out faster but when you start to see it all over, it’s time for a new flat roof. You might be able to squeeze another few years out of it. One thing to look for are buckles. This indicates poor installation, often on top of a previous roof which was not removed. Also, look at the seams where the roofing overlaps. If the roofers did it properly you should see solid black lines, called “bleed out” the entire length of all seams. In the case of roofing, neatness here is not necessarily desirable. It indicates they used the proper amount of hot tar, or, heated the torch roll sufficiently. 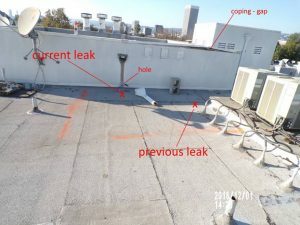 Finding leaks on a flat roof is frustrating, even for a seasoned pro but many times they are obvious: a random puncture, a seam that has come loose, and so on. The most common area for roofs to leak are the drains and fixing these usually demands expertise but, in a pinch, slap some tar around it after carefully cleaning it out. Even more important, if it is a scupper drain, check where it penetrates the outside (stucco wall) and make very sure that is sealed with silicone or caulk of some kind. This can leak in disastrous fashion. Gravel roof issues are not as easy to detect and in that case, it’s best to call a pro. 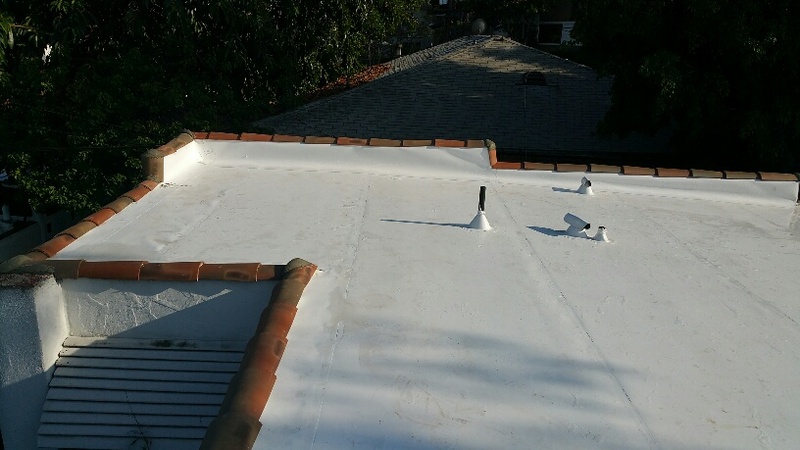 With single ply (smooth white rubber), a flat roof is often quite easy to find a problem, and it’s even easier to seal it up since any decent, exterior grade white silicone or caulk will do the trick. Just carefully clean the spot and seal it up, using generous amounts. Posted on December 24, 2015 by J&J Roofing Co.
Now a few roofers have come and gone, inspected your roof and now you must decide to hire a roofer. What do you do before you decide on a roofer, what questions should you ask? Who will remove my old roof? This should be understood in advance and the same safeguards should be in place with that company as above. It is possible that the bid will be based on not removing earlier shingles, in that case, make sure you understand why this decision is being made. When the job begins, who will be my on-site contact? Usually the person providing the bid is not going to be there when the work is done. You should find out who is the foreman for the job. Additionally, find out who in the company will handle the financial arrangements. Will I be sent a written estimate? If the estimator provides you the estimate there on your front lawn, right after his inspection and attempts to close you, right then and there, we suggest you look for a different choice. The only way he can estimate on site is with a “canned” estimate which will be either too high or missing essential details. What will you charge me for the replacement of plywood if you find rotten or soft roof decking? They should give you a dollar amount per sheet of plywood. If you don’t know this in advance, you might get overcharged once that they have already started the job. Where would you suggest we put the container for waste material? All the refuse from the job including shingle, old wood, packaging, etc. will need to be properly disposed of. Make sure to have this setup in advance or you might not realize that you will lose your driveway or favorite parking spot while they are there. Generally, the roofing contractor will include the cost of this in the bid. If the weight of the waste container cracks the driveway, how will this be repaired? It is possible that the trash will be so heavy that the container cracks the asphalt. Make sure this is included as a possibility and a solution is resolved in advance. What happens if it rains or it’s very windy during the work? How will my property be protected? Do you ever postpone the work? It is important for your home’s interior to be protected by tarps or plastic covers on the roof, in case of rain. If it rains a few days in a row, someone should come out to ensure the covering is still in place. In the case of wind, similar precautions should be taken. Make sure to find out the company’s policy during a rain. What if I am not ready to get the work done? The answer you should get is “not a problem”. Any local, long standing roofing company is happy to get your work done in the coming months and will not hard-sell you to purchase right away. How will you protect the landscaping and rest of my property during the project? This is a discussion you should have by walking around the property and pointing out any area of concern. They will be using a variety of equipment and several workers will be coming and going. Think this over and point out areas of concern. These are great questions to ask when you must decide to hire a roofer. For a Free Estimate – contact us at 323 913 4190 or on our website. How do you choose your roofer? Most likely you have already called a roofer. You know the rains are coming and let’s be honest, in SoCal we don’t really consider roofing a high priority – until El Nino is forecast. So before you choose your roofer, what questions should you ask? How long have you been in business? It’s always best to choose a company that has been around a while. This is something you can use to compare one company to another when making a final decision on which company to use. Are you a licensed roofing company? You need to know this because in California, anyone hired to do more than $500 in contracting work, must have a valid California State Contractor’s License. And make sure it is up to date. Do you carry general liability insurance? This covers your property in case something happens during the work like a window is broken or the house catches on fire while welding something on the roof. Make sure they have a certificate for your home specifically. Does your company have workman’s comp insurance? If you hire a company that does not cover their employees with work comp then if a person is injured on your property you may find yourself with a lawsuit. You can always call their insurance company to verify any insurance if you are concerned about the validity of their coverage. What is your local phone number and address? 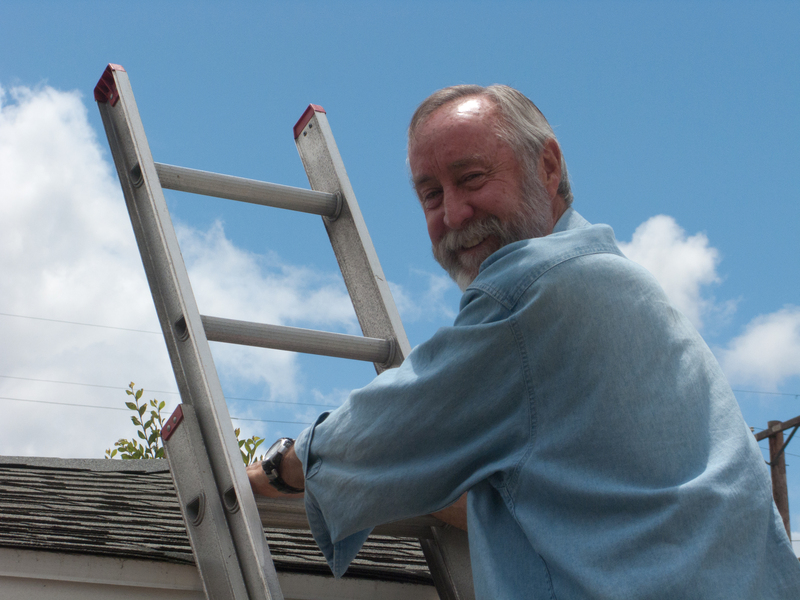 With the threat of El Nino, there are likely to be out-of-town roofers here looking for work. It’s best to choose a local company so if something happens in the future they are easy to contact and willing to return. What warranty comes with my roof? This is an easy question for them to answer. It will help you to understand why different roofing materials cost different prices. Maybe J and J Should Be Your Roofer? J and J Roofing will answer all these questions in the way you need. Maybe we should be your roofer… Call 323.913.4190 to schedule your roof check-up or you can email our Office Manager at staff@jandjroofing.com. But, be smart and do not delay.